We’ve been discussing foods that boost your mood and foods that support your liver lately so I thought, why not post one of my favorite recipes that does both!? This recipe has sulfur-rich cauliflower, antioxidant turmeric, and healthy fats from coconut oil and ghee. Sulfur is one of the key nutrients for supporting healthy detox, while adequate fat intake is important for brain function. Turmeric contains the bioactive compound, curcumin, an antioxidant that supports both your happy moods and your body’s ability to detox! Turmeric contains the bioactive compound, curcumin, an antioxidant that supports both your happy moods and your body’s ability to detox! There are over 10,000 peer-reviewed articles that confirm the impressive health benefits of turmeric. One of turmeric’s most notable powers is its antiinflammatory properties. Some research shows that turmeric is more effective than aspirin and ibuprofen as an anti-inflammatory (and it doesn’t come with the gut-harming side effects of these two drugs). This is important for you to remember, as inflammation can increase your risk of developing practically every chronic illness that we know of. Curcumin is more bio-available when combined with piperine (found in black pepper) or fat. 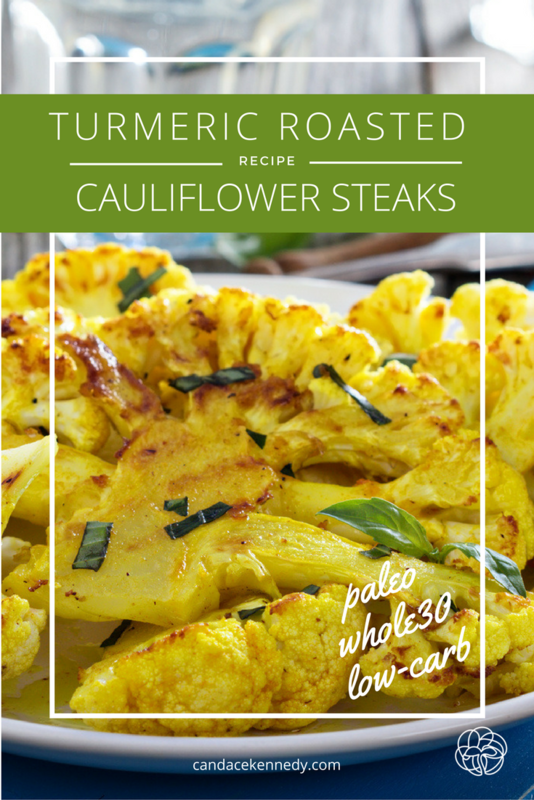 This turmeric cauliflower recipe includes both black pepper and two beneficial fats, ghee and coconut oil, to help your body put this powerful compound to full use. It’s also a pretty quick and easy way to make a beautiful, healthy dish. Toss all the ingredients, except the basil/parsley, and then transfer them to a baking sheet lined with parchment paper. Roast 20-25 minutes, tossing once halfway through baking. Plate and top with fresh herbs. You had me at cauliflower. I used to take a turmeric supplement (not sure why I stopped! Did I run out?) for its anti-inflammatory properties, but had no idea about the mood. I need to order more turmeric! Is there a brand of supplement you’d recommend? oh! Yes, you could double-up on the coconut oil. Or, if you aren’t vegetarian/vegan, you could use a high-quality (grass-fed) rendered tallow. Bacon fat makes everything amazing. There’s a fantastic company that sells rendered tallow and lard. This duck fat is incredible: https://epicbar.com/animal-oils-detail/29. However, a vegetarian option would be to roast in the coconut oil, and then drizzle a little sesame oil on top, after roasted (sesame oil has a lower smoke point, so it’s better to avoid heating it at high temperatures).